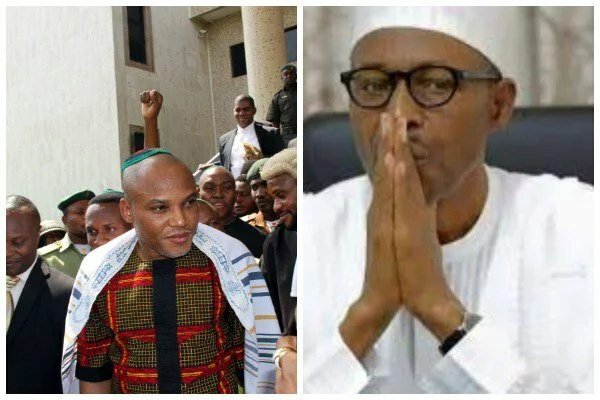 The Peoples Democratic Party (PDP) has been alleged of paying self-acclaimed leader of Indigenous People Of Biafra (IPOB), Nnamdi Kanu, to announce that President Muhammadu Buhari is dead. The special adviser to President Buhari on social media, Lauretta Onochie, made this known on Friday through her twitter handle. She tweeted: “The intelligence of some Nigerians has been insulted by the outrageous lies that @Mbuhari has a double, having died in the UK. This evil is being sponsored by one of PDP’s Looters, the drug infested, crack head, @realffk. He is calling Nigerians, gullible. Nigerians are not! “Recall, at the start of the @Mbuhari/@ProfOsinbajo administration, @realffk, mounted a campaign of targeted calumny on the persons and offices of the President @MBuhari and Vice President, @ProfOsinbajo. He has been manufacturing and churning out lies upon lies. “At a Press Conference on 27th February, 2015, he posited, adamantly, that an oath was administered on @ProfOsinbajo, to force him to resign as the Vice President after the election to make way for Asiwaju Tinubu to replace him That was nearly 4 years ago. But the lies continue. “When @NgrPresident, @MBuhari was declared dead by @lereOlayinka, the media aid to ex-Gov. Ayo Fayose of Ekiti, it was @realffk who in his usual drugged up stupor, lied that the British was working to install @elrufai as VP and later as President in 2019! A lie built on a lie. “In another outrageous lie, and in his warped, deluded and hallucinatory state, @realffk lied that @ProfOsinbajo called the Osun Resident Electoral Commissioner, to influence the outcome of the recently conducted Osun Guber election. A clear an undiluted lie by a serial liar!